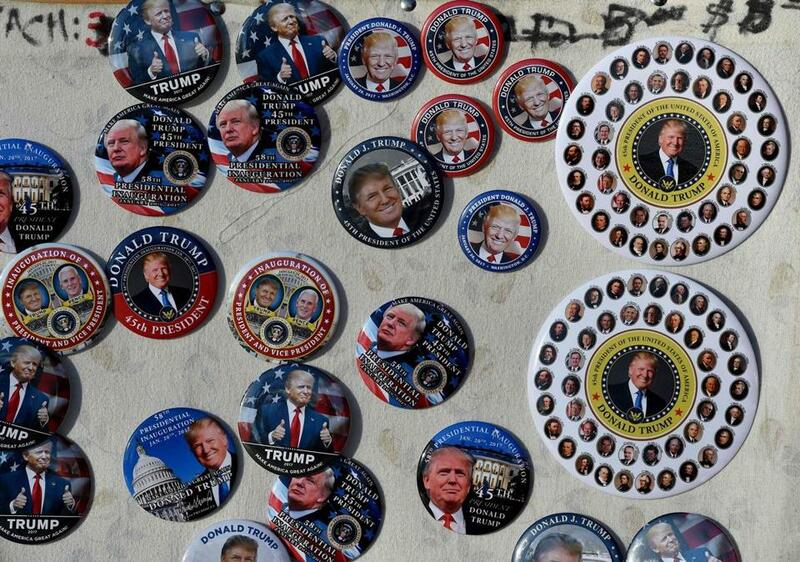 Souvenir buttons were seen on sale at a stand near the White House. WASHINGTON — Riffing on Hillary Clinton’s “basket of deplorables” remark, Jeff Giesea and some friends put together the DeploraBall, a party to celebrate Donald Trump on the eve of his inauguration. The goal was to prove 1,000 of Trump’s hardest core supporters could command a seat at the table in Washington. But the first-time event has become a focal point of debate over the alt-right and its white supremacist influence on the far right wing of the Republican Party. Disputes have broken out over who is invited to the Thursday night event, who will show up, and whether the angry ground-level troops who packed Trump’s campaign rallies will have a lasting influence on the mainstream or — as Trump assumes office along with a Cabinet stocked with billionaires — they will be banished back to the shadows. Organizers, who are charging up to $2,500 a ticket, were even forced to change the DeploraBall venue, a metaphor of sorts for a fringe movement trying to find its way deeper into Washington’s power circles. According to the party’s invitation, Trump adviser Roger Stone, Milwaukee County Sheriff David Clarke, and James O’Keefe, a conservative political activist, are among those expected to attend. Organizers shrug off the controversies and assert it’s all part of the Trump phenomenon. Critics quickly labeled the event a gathering for the alt-right, a white nationalist movement associated with racism and anti-Semitism whose followers emerged as eager supporters of Trump’s candidacy. After one of the DeploraBall organizers went on an anti-Semitic tirade on Twitter, a divide opened up among organizers. Giesea dismissed the association with the alt-right. He said the organizer, who uses the pseudonym Tim Treadstone and tweets from @bakedalaska, is no longer involved in planning the event. Efforts to reach Treadstone were unsuccessful. Instead of alt-right, Giesea offers “Trumpists” and “Deplorables” as descriptions of the people who will be at his ball. He said their ideology encompasses a broad swath of policy demands, from securing the border to creating a stronger national identity to focusing on the middle class and job growth. He said the goal is to “serve all Americans and address the issues that Trump stands for,” as opposed to the alt-right’s white nationalist manifesto. Still, alt-right supporters are traveling to Washington for Trump’s inauguration, and at least 1,000 are expected to attend various parts of the inaugural celebrations, said Richard Spencer, an alt-right leader and president of the National Policy Institute, a white nationalist think tank. Spencer said he plans to attend Trump’s swearing-in ceremony and private events following. Spencer drew national attention in November, soon after Trump’s election, when he greeted attendees at the National Policy Institute’s annual conference in Washington by pronouncing, “Hail Trump, hail our people, hail victory!” The crowd broke out into cheers and many performed Nazi salutes, as caught on video by The Atlantic. Despite the DeploraBall organizers’ efforts to make clear the event is not affiliated with the alt-right, Spencer said he knows many in his movement plan to attend the party. He also said the two movements have similarities, saying the “Trumpists” — or as he calls them the “alt-lite” — are energized by his ideology. The Trump supporters fighting against the alt-right label say Spencer co-opted the term and narrowed its focus on white nationalism, which many Trump supporters disavow. The association with the alt-right, they say, hurts their credibility, and organizers say they want the DeploraBall to serve as a way to assert their presence in Washington. Still, they remain skeptical of Republican leaders in Congress — namely House Speaker Paul Ryan — who some say still have not fully accepted Trump’s victory. “They’re still trying to push their agenda,” Jim Hoft, a conservative blogger from St. Louis, said about GOP leaders. The DeploraBall is now set for Thursday night at the National Press Club, and it quickly sold out its 1,000 tickets. Jeff Ballou, the new president of the National Press Club, said he stands by the statement from his predecessor that the club will hold the private event, “as we have for incoming presidents of both parties for decades,” but the club is not endorsing or sponsoring it. Tyler Pager can be reached at tyler.pager@globe.com. Follow him on Twitter @tylerpager.